So why won’t we utilize this resource as a livelihood project for Guinarona entrepreneurs? Let us count the ways. Water hyacinth is an excellent material for commercial pickles. Hereunder is the method. 1) First we harvest the fresh water hyacinth, chopping out the roots. Next we slice the stems and leaves into the desired sizes and shapes. Set aside. 2) We peel small red onions and mix them whole with the sliced/chopped water hyacinth. We put a plastic mesh on top of the mixture and weights so as to submerge it in the brine/lactobacillus solution later on. 3) We boil enough quantity of water with 15 percent salt by weight. Then we pour this hot brine solution into the water hyacinth-onion mixture. 4) We wait for the brine to cool to 45 degrees Celsius (117 degrees Fahrenheit). As soon as this temperature is reached, we pour in the Lactobacillus starter (ref. Lactobacillus Starter from Coconut Water), equivalent to 10 percent of the water hyacinth-onion-brine mix. 5) We let the Lactobacillus ferment the mixture for at least 7 days. On the eighth day, we wash up our pickle materials in several changes of water and immerse them in warm water bath, so as to take out the saltiness. 6) We prepare our pickling solution by boiling vinegar, water, sugar, and spices (allspice powder, cloves and cinnamon contained in cloth pouch). 7) We arrange our pickle materials in suitable glass containers and pour in the hot picking solution. We then seal our glass jars and let them cool. 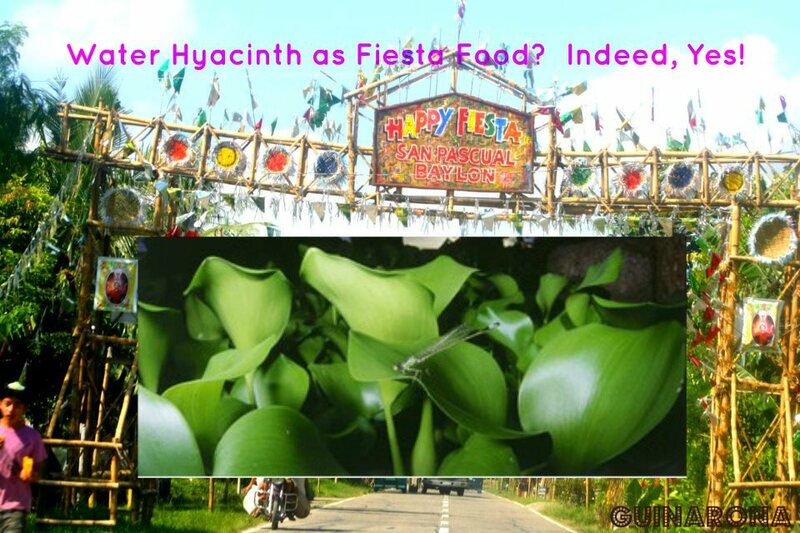 We age the water hyacinth pickles in the refrigerator or at room temperature before use, say at least four days. Presto, we now have our world-class gourmet pickles from the pesky water hyacinth. As in adding immense value to it.